The What: Genelec is unveiling an open IP networking technology platform at ISE 2019. This platform is aimed specifically at the installation market and will deliver power; audio; and scalable loudspeaker system configuration, supervision, and calibration features via a single, standard CAT5 cable. 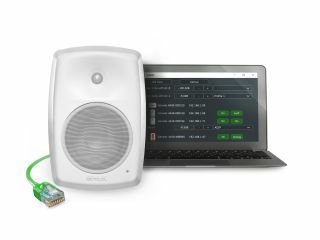 The What Else: Based on IP and Power-over-Ethernet (PoE), the Genelec technology platform includes a proprietary internal power supply that delivers much higher SPLs than was previously possible via any conventional PoE, according to the company. Genelec says its solution is powerful enough to run small- to medium-sized systems. The Smart IP platform solution is compatible with most popular audio-over-IP networking protocols for complete flexibility and scalability. A standard analogue input is also included, increasing the system design flexibility. The Bottom Line: This novel technology will be rolled out over a range of Genelec’s installed audio loudspeakers, commencing in Q4 of this year.